The Canon IXUS III is a compact APS film camera, introduced by Canon in March 2002 - one of the last of the IXUS APS cameras. The IXUS name was used in Europe; in America, it was called the ELPH Z3, and in Japan, IXY i. Unlike most of the other IXUS cameras, the lens has a sliding cover, and the body is longer and lower. Opening the cover obscures the Canon nameplate. 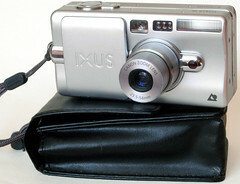 The IXUS III has a collapsible lens, zooming from 23.5-54mm; zooming is controlled by a circular rocker switch on the back, next to the long LCD settings display. The display includes date, mode, frame countdown and film details - the speed and type, Cn for Colour Negative, Cr for Colour Reversal, Bl for BLack and white, and -- for other. Sliding the cover from the closed position reveals the lens, viewfinder and focusing sensors, and switches on the camera, extending the lens. Closing the cover retracts the lens and switches off. The back has the display, zoom switch, flash and imprinting mode buttons, a button to light the display and the viewfinder. The viewfinder is flanked by the APS C/H/P format switch and two LEDs, an orange one for flash ready and a green one indicating whether the subject is in focus (lit continuously), too close (flashing) or impossible to focus (flashing faster). The top carries only the shutter release and self-timer button, which is also the remote-control mode switch (the infra-red remote-control is an optional extra). In the base are the film door, tripod bush, mid-roll rewind switch and door release button. Power comes from a 3V CR2 battery. This page was last edited on 31 May 2016, at 14:41.